The peaceful farming village of Vestor is on the verge of hysteria! Hours ago, brigands kidnapped five ladies of the village, alarming the entire community with the news that the young women were to be gifts for a demon queen! These hard-working people of the land are in need of heroes, and fast! 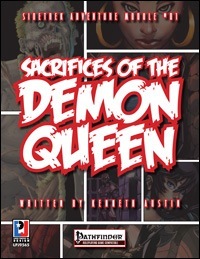 Written by Ken Austin, Sacrifices of the Demon Queen (PRGP) is an adventure for four players of 4th level. The Sidetrek Adventure Modules are designed to be played during the course of a single gaming session, and include suggestions about how to incorporate them into your regular campaign. Encounters are keyed to specific tiles in our Fantasyscape cartography products, line providing high-quality, customizable maps in minutes. In addition to purchasing Sidetrek Adventure Module #1: Sacrifices of the Demon Queen, you get a copy of Fantasyscape: Shrine of the Demon Queen tileset absolutely for FREE!!! Now available directly at Paizo!! !